Order your Visconti Homo Sapiens Bronze Maxi Fountain Pen today from FahrneysPens.com. Fine Pens, Refills & Luxurious Gifts – great prices & fast shipping. The explosively original Homo Sapiens Bronze Maxi Fountain Pen could only be imagined by the inventive minds at Visconti. 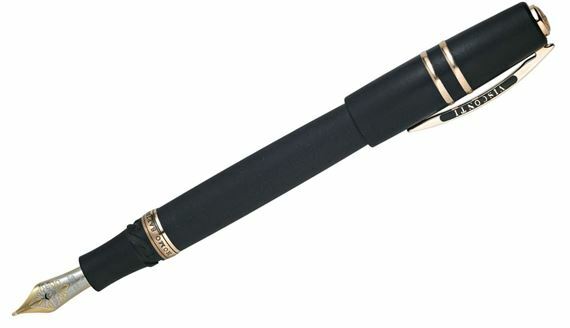 In the 5,000 years since man first began to write, there’s never been a pen like it! The material used for this pen is as ancient as the world: lava from the active volcano, Mt. Etna, on the island of Sicily. Inspired by the Bronze Age, the clip, rings and trim are crafted in solid natural bronze, which has an appealing rose-gold color. Enjoy the benefits of the Homo Sapiens in a fountain pen featuring another design breakthrough: it’s the first fountain pen made with Visconti’s 23K 950 palladium Dreamtouch nib. The 95% pure palladium nib requires no pressure whatsoever to write - its amazing flexibility makes writing a dream! The fountain pen’s high-vacuum power-filler is made of titanium to resist ink corrosion. Writing will never be the same with the Homo Sapiens Bronze - forged from the volcano! I like the balance and the good ink flow. A really nice design, and the cap seals the nib properly so that the nib does not dry when not in use.